It had been a long time since we heard from 80s hitmakers, Club Nouveau, but they gave their many fans a pleasant surprise earlier this year with the release of their new album, Consciousness. 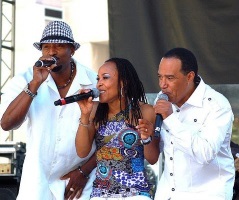 The group’s founders, Jay King and Valerie Watson, joined with original member Samuelle Prater to get the magic going again and released an album that picked up where their many socially conscious hits of the 90s left off. The trio is back with their second single from the album, "So Happy." Jay King describes the song this way: "This is the first time Val, Sam & I have collaborated on a song all three of us together. We are proud of the way it came out and plan on doing more writing together in the future. The music we create today is who we really are and how we truly feel. We hope it strikes a cord with our audience." Check "So Happy" below and tell us what you think! Club Nouveau - "So Happy"